Secon is the one stop solution for all types industrial & technical ceramics applications. 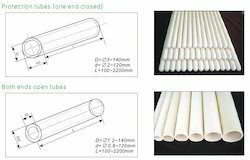 These Protection tubes are used for High temperature Application, Also used in Construction of Noble Metal Thermocouples like R, S Type etc. All Sizes available, Can also develop as per Customised requirement.